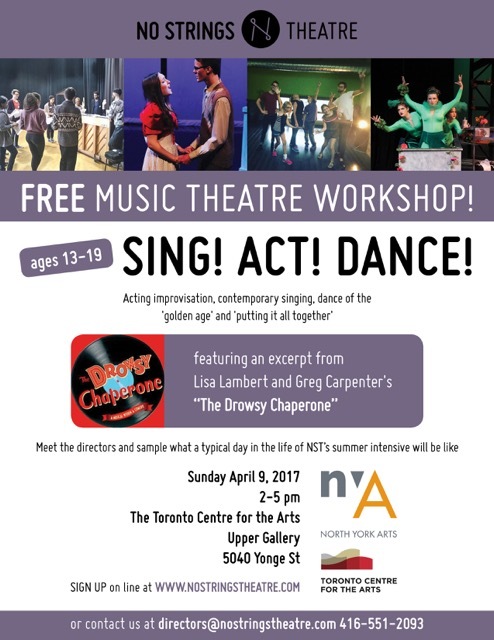 Get a taste of No Strings Theatre Summer Intensive program with this FREE musical theatre workshop.This spring sampler session offer a no-stress, fun and dynamic outlet for young artists wanting to experience a typical day in the vibrant world of music theatre. Led by top music theatre industry professionals, students will be led through acting, singing and dance classes in an environment that is supportive, silly and sensational. find out more about the Summer Intensive program here.